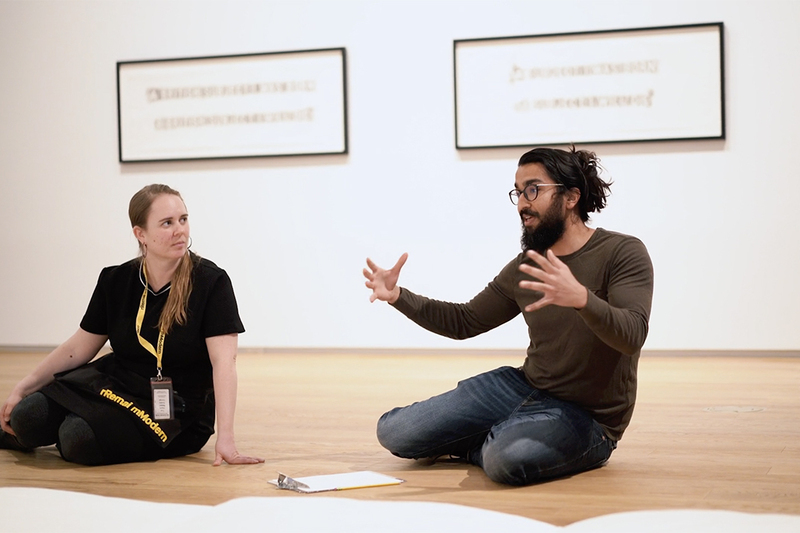 Laurel Boerma (left), Remai Modern program guide with Chris Rampersad, WCVM student. Photo courtesy Remai Modern. Students from the WCVM visit the Remai Modern to explore how art can inform their veterinary practice. The visit is part of a project, led by a group of WCVM researchers from the college’s Department of Veterinary Pathology. The project’s objective is to determine whether fine arts-based observation training can help students as they learn more about cytology — the use of microscopic examination of cells to make a diagnosis. “Many medical schools have incorporated the humanities into their curriculum, and in particular, it has been found that fine arts-based observation training can improve observational skills in medical students,” says Dr. Nicole Fernandez, an associate professor of veterinary pathology at the WCVM. Fernandez sees many potential applications of fine arts training in veterinary medicine. For example, veterinarians could use these heightened observational skills during physical examinations or when they’re interpreting radiology tests or gross pathology specimens. She hopes to provide opportunities for more students to experience fine arts training in the future. The project’s WCVM collaborators included Drs. Hilary Burgess, Ryan Dickinson and Melissa Meachem. The group also worked with art historian Marina Fischer as well as veterinary pathologists Drs. Catherine Wagg and Amy Warren — all from the University of Calgary.